Eriksen got a run in the team and started to shine. Run of games and he will shine. I take skill and intelligence over brawn any day. It's hardly helped Lennon has it. So the general consensus here is that his talent is recognized...just not his ability to shine in the prem. Well a) we've barely seen him play in the league and b) I don't think we would have paid so much on merely potential. Call me naive but i would think transfers involving players from different leagues also take into consideration how well said players are expected to adapt to the prem. i would even go far as to say that those responsible for transfers actually have a system to assess future signings on more than just talent. But hey it seems like a lot of people here know more than the people actually responsible for the transfer of millions of pounds so what do i know? Personally i believe Lamela will come good. All his comments so far have shown that he's desperate to prove himself which is only good for us and himself. I would just hope that he doesn't try to do too much too soon. Can you clarify your last 2 sentences please? Are you saying Lennon has no skill but brawn lol. Edit- Or did you mean John Lennon lol. Merely my own opinion. Other opinions welcomed of course, but don't shoot me down in flames just because I dare to challenge the popular view. I get the feeling/sense that Lamela will never actually fulfil his potential/reputation at THFC. My reasoning for this is simple. He plays as an inside forward and neither has the pace to beat a man on the outside nor the physicality to drop his shoulder and drive inside. These are 2 my 2 major concerns with Lamela. I feel he would be better suited and adapt a lot quicker to a league where physical prowess plays a lesser significance, ie Serie A. Without seeing lots of Lamela (who has?? ), what I have seen would suggest he is not technical enough to play off the front, nor does he have the blistering pace of a wideman to play in a 4, across the midfield. As a fairly optimistic person I would love to be proved wrong, as I do genuinely love to see young players progressing at THFC. Thoughts are welcome, as long as they are constructive and not based on a 4 minute YouTube clip. With that said, I give Lamela till Xmas before a lot of fans start to lose faith and patience with him, before seeing him loaned out in January. I'd say lennon has no skill. Lennon has put on a lot of extra top half muscle. Has the brawn made him a better footballer. I think not. Do you think Eriksen can bench press more than Lamela? or is faster than Lamela? You're comparing an inside forward who will be predominantly responsible for isolating defenders in 1v1 situations and running at pace with the ball, with a central attacking midfielder. Ericksen's role within the attacking unit will to be to find space between the oppositions defence and midfield. When in this space he will be expected to create goal scoring opportunities with clever movements to drag defenders out of position and thread accurate forward passes to team mates in goal scoring positions. Goals scored from this position are a bonus, ask any manager/coach and they would take a higher number of assists then someone who didn't create much but chipped in with the 'odd' goal. The comparison between Eriksen and Lamela is a flawed one IMO. All this talk of bench press and 100m is irrelevant. Nobody has said bench press or 100m times make any difference to a players ability to play football. I brought up the bench press thing in response to a specific comment that said lamela's upper body strength wasn't good enough and therefore he will always get pushed off the ball. I was pointing out the maybe upper body strength isn't the be all and end all. Id say bit of skill, bit of strength and lot of pace. Just made me laugh that you made a comparison between skill or brawn and the player you chose for your argument was Lennon?? Not disagreeing with your general point, just Lennon is not the first player that springs to mind when talking about brawn lol. Vinnie Jones maybe? Theres an example of brawn over skill. I think your perception of the system is too rigid. You focus too much on the 'roles' so-and-so will occupy which completely misses the point that the front three (or four including the striker) is supposed to be fluid and constantly moving. Why do you think Poch puts so much emphasis on fitness? Its too ensure that our players can keep moving long after the opposition are worn out. Notice how the key to this system is not who can run the fastest or who can stay on the ball the longest, but rather who can perform best as part of a fluid attacking line. Its a system which requires players who are technically proficient, can move the ball quickly and versatile enough to do so from a variety of positions in the oppositions half. You should have a look at LukeBB's post on the Seattle game for greater insight. Its a system which requires the attacking mechanism to be greater than the sum of its individual parts. Ergo rigidity in terms of player position will hardly be of use to us. Lamela will not simply be an inside forward but a fulcrum and spearhead as well, depending on his position at the time. The same goes for Eriksen and whoever else is part of the attacking line. In that way the scoring burden is distributed across the front four to maximize goal scoring opportunities. Eriksen's game is based on passing. He rarely takes on a large defender with the ball at his feet and tries to bypass him. Lamela's game is based on dribbling and beating men one-on-one. Thus Eriksen's slight frame is not a problem for him, but Lamela's lack of physical strength to withstand barging and obstruction is a major problem for him. As for the spurious comparison that keeps being made with Modric and has appeared again on this thread: Modric is a wiry, extremely strong man with a small frame. 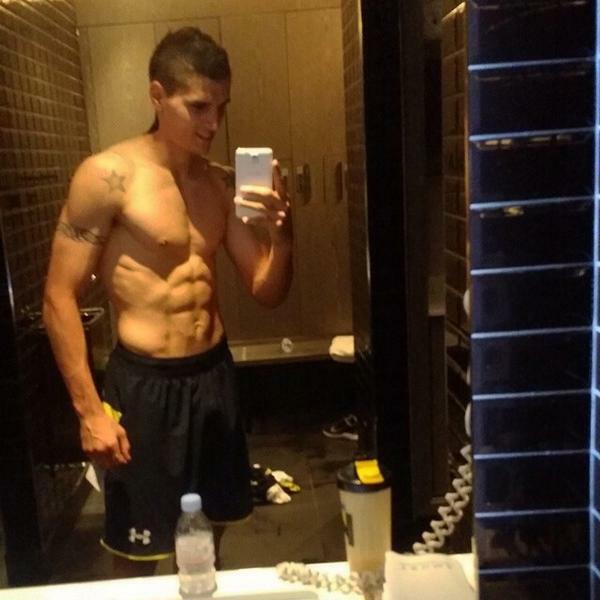 He's tough as hell and has exactly the kind of upper body strength that Lamela lacked last season. It's not about bulk, it's about torso strength. I'm trying to think of some good PL attackers that lack upper body strength - there's Crouch who handles himself pretty well but his height helps though can't hold up the ball which is hardly needed of Lamela. Torres was once a great player, speed perhaps helped! Can anyone think of any others and how they cope without the strength? Would Messi or Neymar cope in the PL? I think so but there seem to be a lot of players who flop here without the UBS. Surprised that he hasn't developed himself more over the last 6 months. I am so hoping Lamela, Soldado and Paulinho come good this season. Shut those mouthy scousers up in the process. I generally agree with the OP. He wasn't saying that Lamela won't be great for us - he will. The point was that he'll be even greater for somebody else, given the characteristics of the PL. CR7 and GB became much more effective as they bulked up, so why should EL be any different. I am totally sold on Lamela, even the mark 1 skinny version. The beefed up mark 2 version will be world class, and hopefully still a Spur. The strength argument has been done before, it's not about having supreme upper body muscle it's about having strong core muscles i.e the abs and waist. If you look at players like Ramires, Sanchez and Modric, Messi, Iniesta - players who aren't exactly bulky but rarely get pushed off the ball, why? Because they use their lower body to protect the ball from defenders. In fact if you bulk up too much on your shoulders chest and arms it slows you down and makes you less agile especially for a player like Lamela where his agility is absolutely key to the way he plays. Have you seen the latest pictures he's been releasing on Instagram showing off his body? He's developed his core and his legs have got bigger therefore he has actually baulked up in the key areas. Another perfect example is David Silva, not particularly quick however always manages to find space because he's a clever player, when he is engaged by a defender he's able to shrug them off because he has the physical capabilities to. I really don't understand this notion that everyone thinks you have to be baulked up to the max to be successful in the Premiership, the only difference this league has over the others is that it's played at a faster pace and there are more turnovers so if anything you need to be fit because you do more running. The way people go about the Premiership is as if defenders are 7ft ogres lol. Excitement being replaced by optimism when a new player doesn't score a shed-load in the first few games. Optmism takes over with the hope that this player 'needs time to adapt', 'learn the language', 'get match fitness' etc etc. Usually around Oct/Nov the optimism has died a death and pessimism rears it's ugly head. Pessimistic views about "how the money could of been better spent on 'X, Y and Z' and let's not forget the famous "with the same money we could have bought...*insert flavour of the month*" (who remembers the Amir Zaki fan club up until Xmas, only for them to dissapear by May). Finally pessimism is seen off by Hatred and abuse. Before said player is sold/loaned or dropped. In this case the Jan transfer window. Now this may sound ironic, judging by my initial concerns but to make it clear, I would give my left ball bag for Lamela to pull up trees on his way to being a top player. However, as I sit here and type this I have major reservations. I would love to be proven wrong. So whilst he wears that big chicken proudly on his chest I will support him throughout and cheer him on like everybody else. We are after all "One Club"
Hi TPd....I'm not so sure many of us expect Lamela "to score a shed-load in the first few games"; but in all fairness he has to show enough to warrant a starting place. In the bigger picture, T.H.F.C. are in the Premier League where there is a lot of money hinging on where they place in it. So, like it or not Erik Lamela is going to be under pressure to step up and perform. Fans of T.H.F.C. expect him to, not be perfect every game - indeed he will have stinkers of games where he might be dropped from the starting eleven - but to show some determination to fight back and find his place, is all that we, as fans ask. That's why Eriksen and even Dawson - for all of his mistakes - are respected by fans. If that is seen by some as "pessimism rearing it's ugly head" then so be it. I'm not so sure how true that is to be honest. I don't see Lamela's game as being soley based on beating people 1 on 1. In a lot of his games with us you could see him, in the first instance, he'd always look to pass around a defender and quickly offered himself for a 1-2. Eriksen has played out left for Ajax and us and his slight frame hasn't been too much of a problem. IMO, I see Lamela's game being based on intelligent movement, quick incisive passing and, like you say, using his dribbling skills to beat men as well, but not just solely the latter. Lastly, as Eriksen showed us when he played out left, Lamela will find himself in central positions quite a lot and will drift in quite a bit. At the end of the day, I would hope that any of the trio behind the striker will be fluid in their movement and have a well developed "all round" game that isn't determined by their physique, or lack thereof.